Knock on Wood (Eddie Floyd, 1966). Knock On Wood (Bowie, David Live, 1974). Knock on Wood (Bowie, live, 1974). [America] filled a vast expanse of my imagination; I was always pretty imaginative. Imagination can dry up in wherever, living in England, often—if there’s nothing to keep it going. It just supplied a need in me, America, became a myth-land for me. I think every kid goes through it, eventually. I just got onto it earlier. David Bowie, Cracked Actor, 1974. In the opening minutes of Alan Yentob’s Cracked Actor, a BBC documentary of David Bowie in the US in mid-1974, Bowie is shot sitting in the back of a limousine driving through the California desert. It’s a bit like Nosferatu touring Death Valley. Throughout the performance, as it’s very much a performance, Bowie keeps picking up on the song playing in the car, Aretha Franklin’s “Natural Woman,” wanly delighting in its call-and-response vocals: he seems to be craving the song, using it as a means to keep himself in focus. So begins Bowie’s soul era. Bowie’s move into soul/R&B in 1974 could be seen as a calculated, even slightly exploitative move: Bowie giving his secretary a list of contemporary R&B records to purchase as research, Bowie going to Sigma Sound to have the Philadelphia International house musicians craft a soul album for him. Yet this ignores Bowie’s long-documented love of soul and jazz, and that he had started out making records as a Mod soul singer, covering Bobby “Blue” Bland (“I Pity The Fool”) and writing Sam Cooke tributes (“And I Say to Myself”); even at the height of the Ziggy Stardust era he had covered James Brown songs on stage. So the soul-inspired ’74 Philly Dogs tour, and the subsequent Young Americans record, can seem like a return to first things for Bowie, a further step back after his psychedelic/Mod tribute Pin Ups. Of course this wasn’t quite the case, either. Bowie would use soul as a way to get out of an aesthetic dead-end, as a way to finally get an American hit record. He treated the music with respect but also without much reverence, using soul as a means, making his own twisted version of it. As it turned out, this made him a trenchant interpreter of contemporary black music (it’s no surprise that Bowie was one of the first white artists to play Soul Train). Bowie’s Diamond Dogs tour began in June 1974 in Canada and in mid-July the tour was in residence at Philadelphia’s Tower Theatre, with the five Philly shows taped for a prospective live record. Until Philadelphia, the shows had consisted of revamped hits like “Space Oddity” and “Changes” and the new Diamond Dogs material, but now Bowie put Eddie Floyd’s “Knock on Wood” in the middle of the set list. “Knock on Wood” seemed at first intended to be a breather for Bowie’s band and his audience, as it brightened the mood after the dark extravagance of the “Sweet Thing” suite and, often slated to follow the uptempo “Watch That Man,” built up the show’s momentum. “Knock on Wood” is soul at its most welcoming and democratic, whether in the easy, undemanding vocal (a good fit for Eddie Floyd’s voice, though originally intended for Otis Redding), or the utter basics of its groove (Al Jackson playing ones and threes on the bass drum, twos and fours on the snare) or structure. It was written by Floyd and Steve Cropper, with Floyd providing the lyric and vocal melody and Cropper the chords/riffs. Cooked up in Memphis one evening in June 1966, “Knock on Wood” was built by committee, as everyone in the studio that night offered something: Isaac Hayes wrote the sprightly horn line for the bridge, while Jackson contributed the “knock-knock-knock-knock” drum hook (Floyd later said Jackson was inspired by “Open the Door Richard”). While initially rejected by Stax owner Jim Stewart, who thought it was too much of an “In the Midnight Hour” knock-off (which, admittedly, it was), “Knock on Wood” topped the US soul charts upon its eventual release, and was a UK hit as well. Bowie’s performance recorded for David Live is anchored by his new guitarist Earl Slick (whose guitar replaces the horn riffs in the verses) and his now-established rhythm section: Herbie Flowers on bass and drummer Tony Newman. While the trio aren’t quite Booker T and the MGs, they keep a vigorous groove, with Slick on offense while Flowers follows Donald “Duck” Dunn on the Floyd single, providing melodic variations on bass. Letting down the side are Mike Garson, who seems unwilling to commit to the groove, and the stiff horn playing of David Sanborn and Richard Grando (the latter in part because much of the brass was overdubbed in the studio later). Bowie, his voice worn down after a month of nightly concerts, delivers the song credibly, if keeping very close to the record (by contrast, Floyd often riffed and improvised on stage). Recorded 8-12 July 1974 at the Tower Theatre, Philadelphia. On David Live, and also released as a single in September ’74 (RCA 2466; #10 in the UK) (odd TOTP clip here). 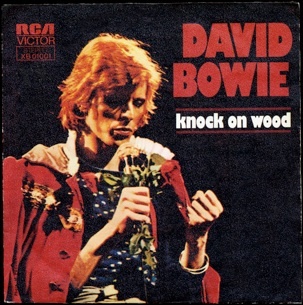 Bowie’s relative hit single revived “Knock On Wood,” arguably inspiring a host of further covers, some majestic (the high disco of Amii Stewart‘s 1978 single), some dull (Rachel Stevens). 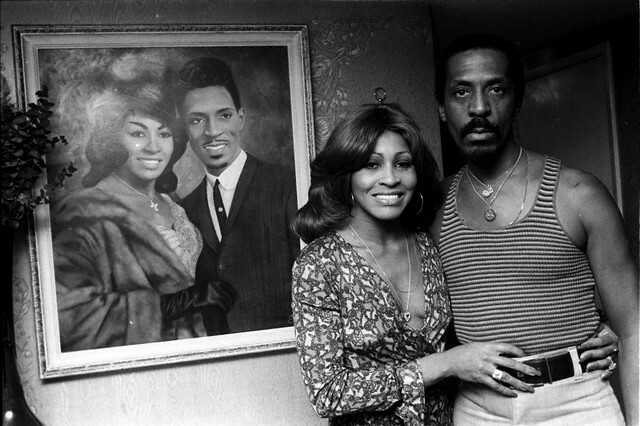 Much of “Knock on Wood”‘s history is from Rob Bowman’s fine Soulsville, USA. This entry was posted on Wednesday, September 29th, 2010 at 10:11 am and is filed under Middle RCA Years: 1973-1976. You can follow any responses to this entry through the RSS 2.0 feed. Both comments and pings are currently closed. 1974 David Bowie, with the copper hair, is the most fascinating version of Bowie to me. Drugs, ideas, more drugs, big ideas.